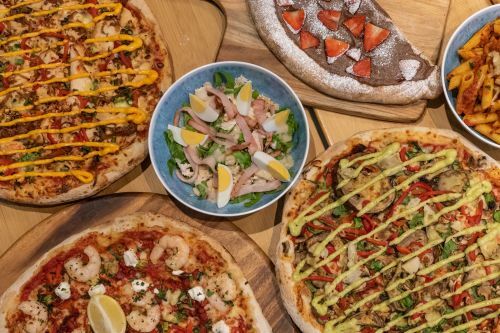 Pizza Workshop- Caringbah uses their own specialised couriers to deliver their food. Garlic confit, mixed herbs and mozzarella. Olive tapenade base, mozzarella and feta. Sweet chilli base, mozzarella and basil. All pizzas on tomato base unless specified. Mozzarella, oregano and fresh basil. Mozzarella, smoked ham and pineapple. Mozzarella, smoked ham, mushroom and Kalamata olives. Mozzarella, smoked ham, bacon and egg. Mozzarella, semi dried tomatoes, baby spinach, mushrooms, eggplant, roasted capsicum, artichokes, Spanish onions, bocconcini and pesto aioli. Béchamel base, mozzarella, gorgonzola, feta, bocconcini and basil. Mozzarella, fresh tomatoes, Spanish onions, bocconcini, balsamic glaze and basil. Mozzarella, BBQ chicken, roasted capsicum, caramelised onion, shallots and peri mayo. Tomato and garlic base, mozzarella, BBQ chicken, Spanish onion, prosciutto, fresh tomatoes and pesto aioli. Mozzarella, tandoori chicken, shallots, cashews and tzatziki. BBQ base, mozzarella, BBQ chicken, mushrooms, Spanish onions and shallots. Satay base, mozzarella, BBQ chicken, mushrooms, Spanish onions and tzatziki. Mozzarella, prosciutto , tomatoes, rocket and Parmesan. BBQ base, mozzarella, smoked ham, pepperoni, Italian sausage, BBQ chicken, ground beef and bacon. Tomato and garlic base, mozzarella, pepperoni, Spanish onions, fresh capsicum, ground beef, bacon, pineapple, olives, feta and chilli flakes. Mozzarella, smoked ham, pepperoni, mushrooms, Spanish onions, fresh capsicum, pineapple, Italian sausage and olives. Spicy tomato salsa base, mozzarella, chorizo, Spanish onions, roasted capsicum, jalapenos and chilli. Garlic base, mozzarella, lamb, fresh capsicum, Spanish onions, fresh tomatoes, feta, oregano, tzatziki and lemon wedge. Tomato and garlic base, mozzarella, Italian pork sausage, fresh tomatoes, Spanish onions, olives and basil. Mozzarella, smoked ham, fresh tomatoes and pineapple. Mozzarella, semi dried tomatoes, roasted capsicum, shallots, marinated prawns, feta, mixed herbs and lemon wedge. Sweet chilli sauce base, mozzarella, baby spinach, fresh capsicum, shallots prawns, basil and lemon wedge. Mozzarella, semi dried tomatoes, mussels, scallops, marinated prawns, bocconcini, mixed herbs and lemon wedge. BBQ base, mozzarella, BBQ chicken, mushrooms, Spanish onions, shallots and peri mayo. Mozzarella, baby spinach, mushrooms, eggplant, roasted capsicum and pesto aioli. Mozzarella, chorizo, fresh tomato, Spanish onion, olives and lemon wedge. Mozzarella, lamb, Spanish onion, fresh capsicum, feta, tzatziki and lemon wedge. BBQ base, mozzarella, BBQ chicken and pineapple. Slow cooked beef in a rich tomato sauce. Bacon, smoked ham, mushrooms, shallots and cream. Baby spinach, semi dried tomatoes, fresh mushrooms and roasted capsicum topped with cashews and Parmesan. Cos lettuce, tomato, Spanish onion, cucumbers, oil balsamic dressing on side. Rocket, Parmesan, pear and walnuts. Add gorgonzola for $1.00. Cos lettuce, Parmesan, bacon, croutons and anchovies. Add BBQ chicken for $2.00 and boiled egg for $1.00. Rocky road with icing sugar. Strawberry or banana with icing sugar.